DEDICATION: These Letters are Dedicated to World Peace and are published in Honour of all who Suffered in the First World War. 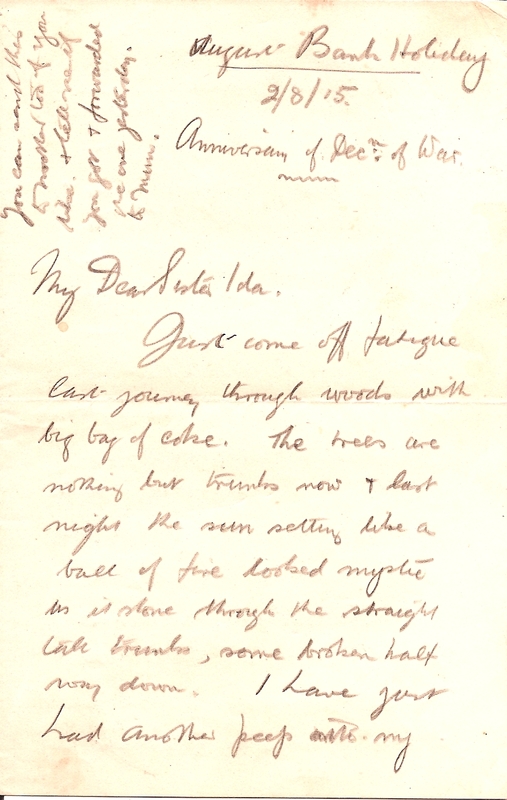 This remarkable collection of letters, original drawings and sketches, sent Home to his Family at 95, Foden Road, Walsall, tells the First World War story, in his own words, of my father, Private Arthur Hubert Hibbett, 1/5th South Staffordshire Regiment. Most have no address but their exact geographical location along the Western Front, was discovered with the help of the Regiment’s Official War Diary and Bertie’s own War Diary, A Little Book of Words and Doings. Together with My Memories of the First World War, written in 1967, Bertie Hibbett’s Letters will be of value to historians, teachers and all interested in the history of the Great War and its Aftermath. Today, as I gently open out the flimsy sheets, I wonder at their history and the journey they have made from the trenches, through the years, into my hands. I think about those who first opened and read them and of the brave young man, much younger than my own son now, who wrote them. Reading the letters, one after another, I feel I am in the same position as those who first received them, entering into my father’s life at the Front, seeing it unfold day by day and week by long week, waiting in expectation of what will happen next, caught up in the immediacy of it all. I want all who read them to be in that position too. August Bank Holiday. 2/8/15 Anniversary of Decl. of War. A RICH COMBINATION OF FACTORS, both fascinating and informative, make the letters unique. THEY ARE WRITTEN FROM THE PERSPECTIVE OF A PRIVATE rather than of an Officer; one who had volunteered as a Mining Surveyor Apprentice at the outbreak of War but who, by Armistice Day, 1918, had entered Lichfield Theological College to train for ordination as an Anglican Priest. THEY ARE LETTERS TO A WHOLE FAMILY, not only to his Mother and Father, but to three Brothers and a Sister, as well as to a Godmother and a number of close friends – the varying style in each reflects the different relationships. 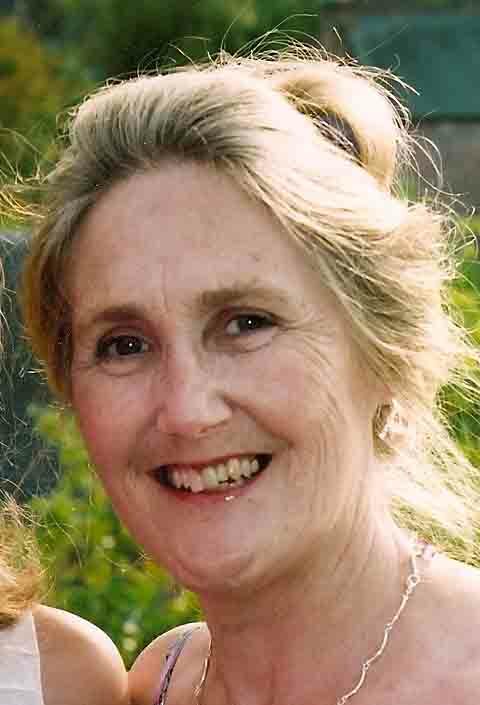 Readers will be able to follow not only the emotional & spiritual development of a sensitive, intelligent, young man but also to gain a picture of his ‘most painstaking and loving mother’, that quiet father ‘kindness itself’, that compassionate, wise sister and those ‘thoughtful’, kindly brothers at home, where my father longed to be. THE LETTERS ARE ABOUT EVERYDAY LIFE IN THE TRENCHES; the horror of War is conveyed through understatement, rather than by graphic description of battles and charges. 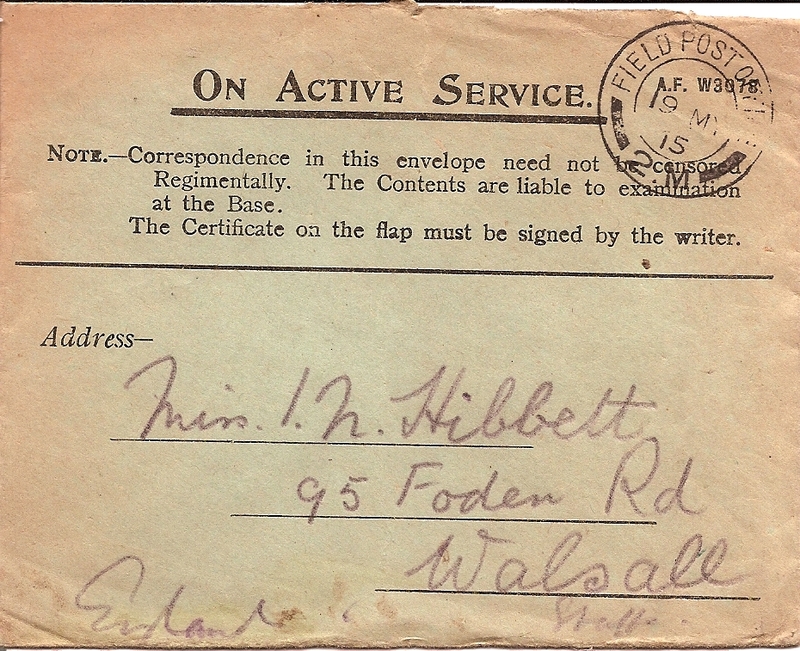 With letters written every few days, they cover a period of two and a half years, almost without a break, from Bertie Hibbett’s enlistment, his training in Luton and Saffron Walden, through 16 months at the Front – to the loss of his brother and his own wounding at the Battle of the Somme, July 1st 1916. 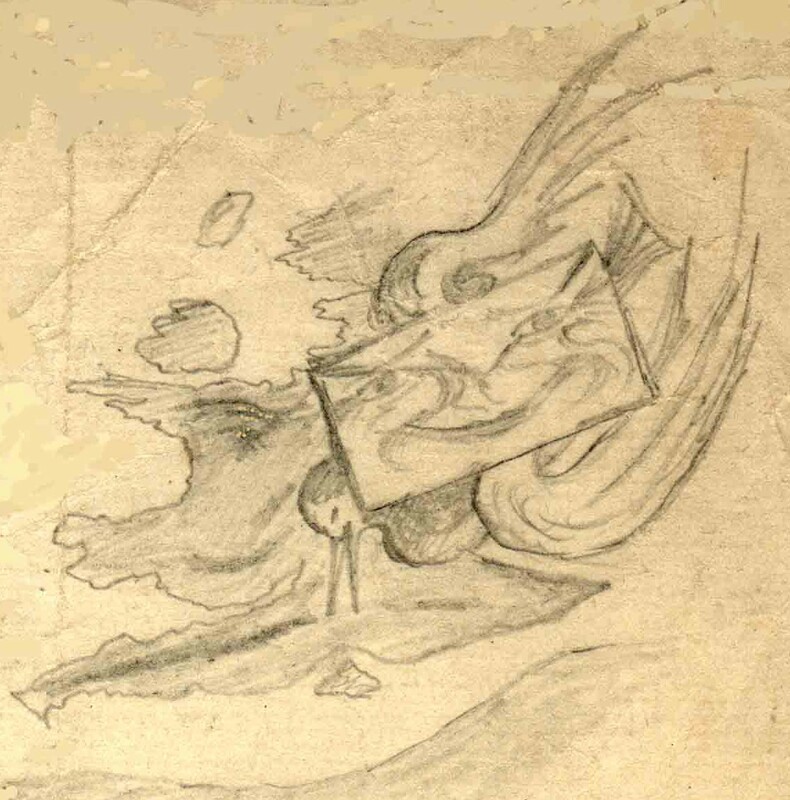 They continue through long months in the Red Cross Hospital at New Brighton (where he wrote and drew with his left hand), to his discharge from the Army in 1917 and his entry into Lichfield Theological College and the Anglican Church ministry. Smiling Letter Flying Home before the Battle of the Somme. 1916. 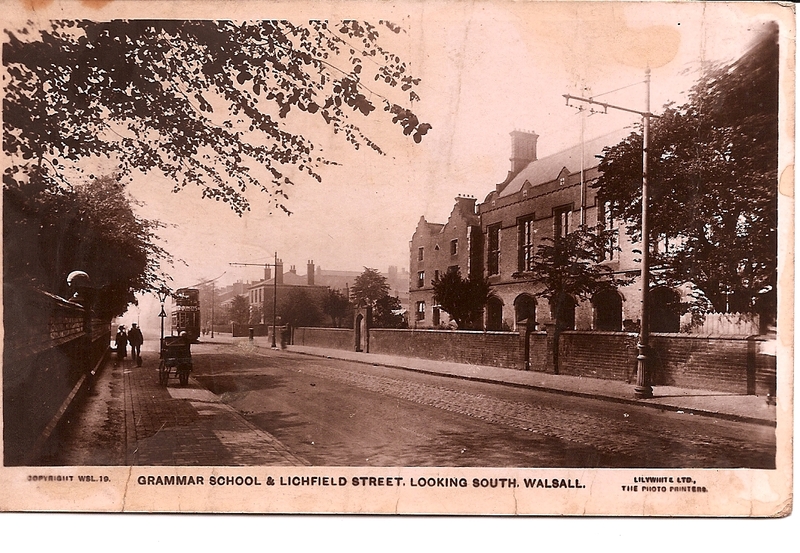 LOCAL AS WELL AS MILITARY HISTORIANS will be interested in the light shed on the South Staffordshire Regiment and on Queen Mary’s Grammar School Walsall. Some 70 officers and men are mentioned by name (many of them Old Boys of QMS), together with those of prominent members of Walsall Borough Council. 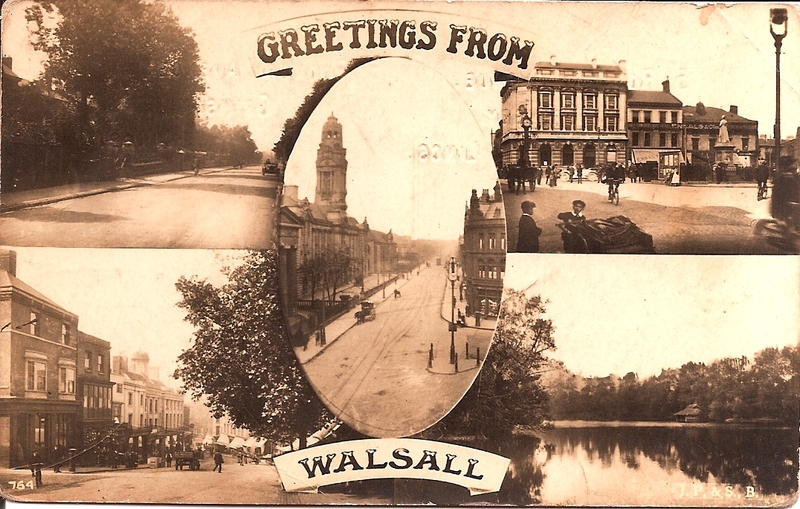 They tell the story of the impact of War on professional middle class families, of their War effort and support in the way of parcels as well as letters; they tell of middle class education and values pre-1914 in one town in the Midlands. They also provide valuable information concerning contemporary Christian Faith & Church life at Home and at the Front. With numerous sketches and drawings, they tell the story of one young soldier’s courage, humour and hope in the face of extremity, and of his journey from boy at war to man of peace. 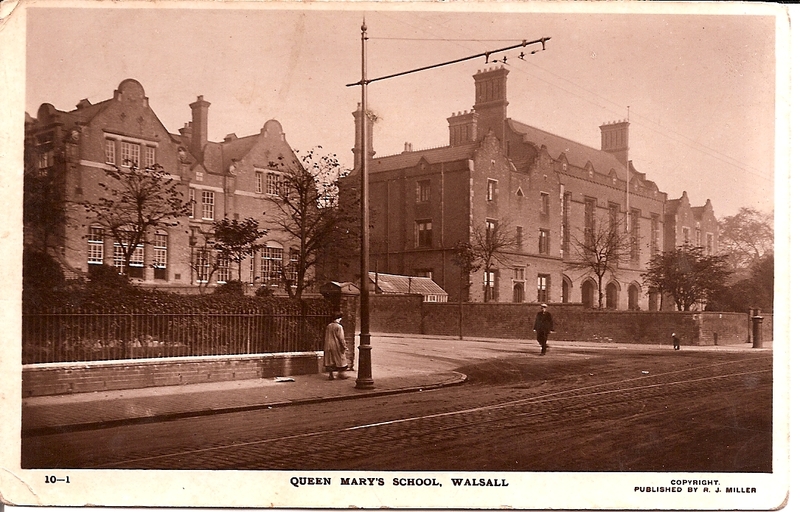 Queen Mary’s Grammar School, Walsall. 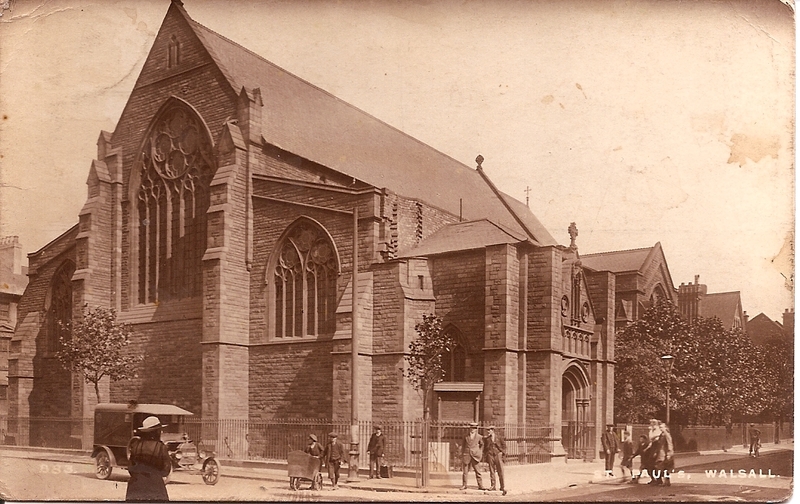 ST PAUL’S CHURCH WALSALL 1914. Now called The Crossing at St Paul’s. IT IS THE UNWITTING, FIRST HAND EYE-WITNESS quality that gives Bertie Hibbett’s letters their sociological and educational value. Longing for letters and loving to write them, his words tumble onto the page, with postscript after postscript in an agony not to finish. ‘It is only the tie of family love I want really’. Invariably cheerful, amusing, courageous, Bertie is almost overwhelmed at times by the mixed emotions of duty, loyalty, love and fear. He knew what it was to be utterly ‘HBD’, Heart Bowed Down. Desperately home-sick, craving for the Home Leave that never came, he suffers the intense pain of boils ‘like toothache in the neck’, trench foot & shell shock that were to plague him for the rest of his life. Watching over his elder brother with fierce love and pride, trying to keep up the courage of his pals in the worst of the shelling, Bertie is torn between gaining sympathy by telling his mother ‘all about me sen’ and trying to shield her from the unspeakable horrors of his life out there. That his ‘humble scribblings’ should be studied seriously as part of a school or university curriculum, and be worthy of exhibition, would have filled my father with wondering astonishment. Whilst he loved writing letters, to entertain himself and his family, his main thought, each Sunday, was to reassure his mother of the safe arrival of parcels and thereby of his own safety. Certainly the faith of his family was a daily comfort, especially that of his Mother, whom he pictures in the familiar pew in St Paul’s, Walsall. My father’s firm belief in the power of good over evil, that ‘everything works together for good’, is reflected not only in the biblical quotations heading most of his letters from the trenches, but also in his lyrical descriptions of Mother Nature, of sunlight and bright mornings, of animals and birds and also of flowers, picked to adorn the dugouts, to press and to send home. 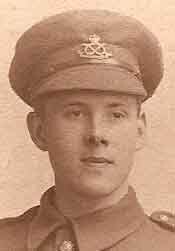 ‘At last I have found a few June roses’, he writes to his mother in his last letter Home before the Battle of the Somme, 1st July 1916. EDITING: Allowed to tell their own story, the letters stand with just enough editing to make Bertie’s language, quaint spellings and abbreviations, intelligible today. EFW. 2014. This is a wonderful site, beautifully and lovingly created. My grandfather died in Trench 32, killed by a sniper on 31 August 1915. Bertie Hibbert was in that trench in August. Would it be possible to see exactly what he wrote about it? I think it would probably be the only description I would ever find.